A practical guide to over 25 different fruit and veg to grow in your garden with over 100 tried and trusted, easy to follow recipes and tasty, quick cook dishes. In their North Yorkshire garden, they grow a large selection of fresh fruit and vegetables that are all put to good use: some eaten fresh and others stored or preserved. Martin, a professional gardener, has been growing vegetables since he was a teenager and he draws on his many years of practical experience to give easy- to –follow advice and tips on getting the best from your crops. Martin, a professional gardener, has been growing vegetables since he was a teenager and he draws on his many years of practical experience to give easy- to –follow advice and tips on getting the best from your crops.Jill loves food, especially when it involves fruit and vegetables picked fresh from their garden, and she shares a selection of her seasonal dishes, many of which have been family favourites for many years. “What immediately strikes you is that this book is packed full of practical information, common sense – and inspiration. Martin and Jill can add a personal message to your book, If you have bought with PayPal, fill out the form below. If you are paying by cheque, include your message. ""A great book, easy to read and full of facts, information and tips. 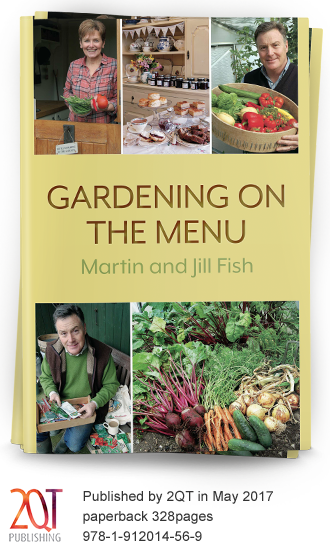 I almost feel that I'm working in the veg plot with Martin and cooking something tasty with Jill in her kitchen!""